Moray MSP Richard Lochhead has backed calls to make a notorious Speyside road safer. More than 500 residents have supported a petition urging Moray Council to install a crash barrier on a corner between Dufftown and Drummuir. 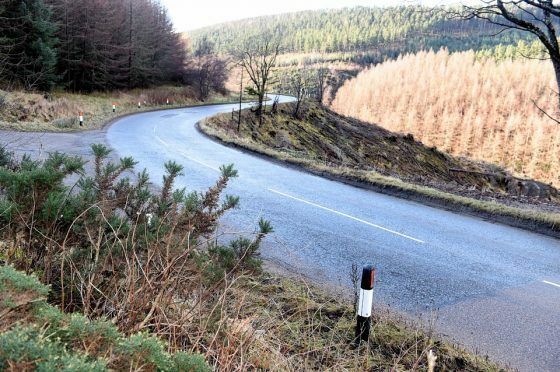 Dufftown Community Council launched the appeal in the belief that motorists could plunge down the steep Parkmore brae, which has been left bare following tree felling activity on the B9014 Keith-Dufftown route. Moray Council installed chevrons around the bend, and has erected signs warning drivers of the upcoming hazard. They say the moves are sufficient to minimise any risk of accident. And now Mr Lochhead has urged the council to heed local worries and revise its stance. He said: “Serious concerns around driver safety at Parkmore brae have arisen, those who use the road between Keith and Dufftown have expressed real fears about what could happen in the event of an accident. The Holyrood politician has written to the council’s chief executive, Roddy Burns, imploring him to rethink the authority’s position. Last night, Dufftown Community Council said Mr Lochhead’s support was “encouraging”. Community councillor Jim Nicol said: “Our petition is going really well, and has more than 500 signatures already. “We aim to get 1,000 over the next few weeks and we don’t think that will be a problem. Regular users of the road say the “notorious” bend had often sent vehicles careering into the trees by its side. But they were cleared by a private landowner as part of a huge felling scheme. Campaigners say it could now be hours before stricken cars are spotted in the valley below. Moray Council said after the trees were removed officers performed a series of tests to ensure it was safe. A spokesman added: “We tested the road at the maximum speed allowed, and the bend was negotiated quite safely.